The HanGenix™ Compliance Assurance System is an easy-to-install, ultrasound-based technology, which creates Patient Protection Zones™. 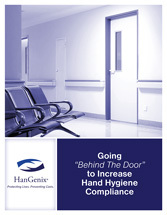 The system measures and documents hand hygiene compliance prior to and immediately following patient contact, and provides visibility into compliance ‘Behind the Door’ – not just ‘at the door’ – thus reinforcing the W.H.O. My 5 Moments Guidelines and optimizing adherence.